Manager: I hear we increased our sales by 100% this year! Bravoooo! Sales Rep: Yes sir, we went from one product sold to two this year! While people tend to make fun of their sales peers, all sales managers know that their problems are no laughing matter. And the truth is — most of their problems boil down to lack of team communication and transparency in the company — from long emails threads with no clarity whatsoever to the unavailability of sales-enabling resources such as brochures, presentations or price lists. And then the worst happens. The customer buys a competitor’s product or service. MAYDAY! MAYDAY! WE LOST A CUSTOMER AGAIN! You heard it right! 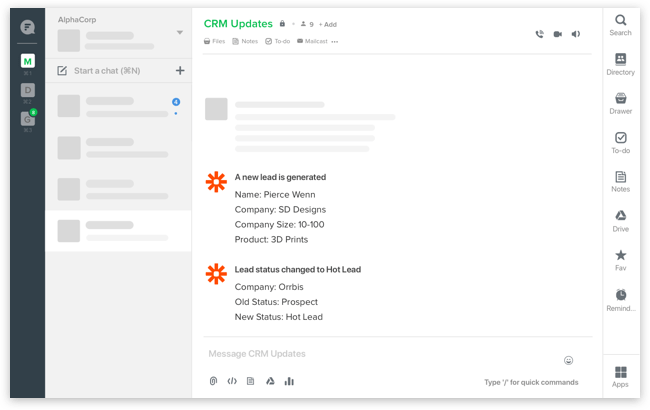 With Flock, you no longer have to go to Zoho, HubSpot, Salesforce or other CRMs for updates. Simply integrate your CRM with Flock via IFTTT or Zapier, and receive real-time updates in a Flock channel. This way, you have real-time knowledge of every lead and can work towards moving them to the top of the funnel. Hurray! Mapping customers, creating personas, forecasting, and setting quarterly targets are important practices that aid in a sale. Wouldn’t it be tragic if you lost a customer because a sales rep didn’t have access to this information? With Flock, you can share and access all your files in a click or two. All you have to do is authenticate your Google account in the pre-installed Google Drive app. You can create new files, browse through your repository, share files with your team, and grant viewing/editing access from within the app. Plus, with the nifty Flock app on mobile, your reps on field don’t have to juggle between laptops and poor Wi-Fi connections. They can click on the file link and view the file instantly — on their smartphone. You can also integrate Dropbox, OneDrive and Box for super-fast document sharing. In 2007, it took 3.68 cold call attempts to reach a prospect. Today it takes 8 attempts. 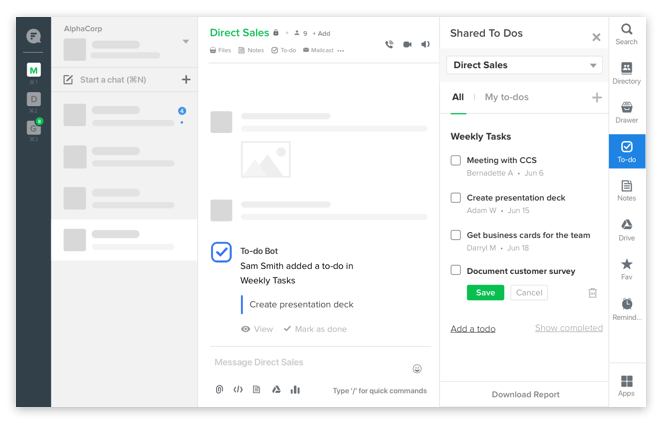 Why not plan your calls better with Flock’s Shared To-Dos? Now, your team can list all their tasks and be notified of due items in Flock. Say you just landed a good number of prospects and want to divide them among your team. All you have to do is create a Shared To-Do list with all prospects, assign them to your reps with due dates, and bam! Your team is ready to crack even the most complex sale! Plus, for vital events you don’t want to miss, like the “weekly forecasting” meeting with your team at 4 pm, simply set a quick reminder in Flock and you’ll be notified in time. Tasks and deadlines have never been easier to chase! 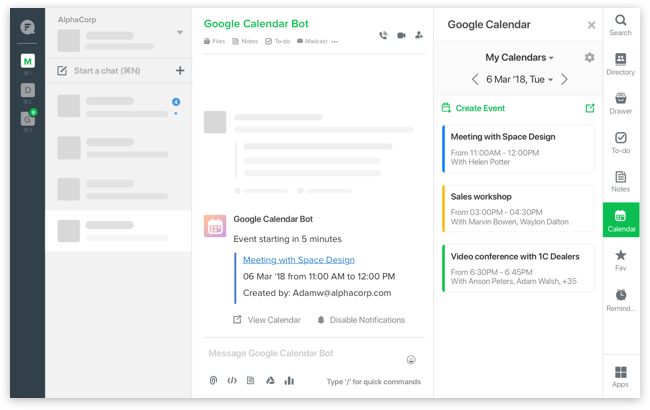 Prefer to work with Google Calendar? Integrate it with Flock to manage everything from setting up an events to accepting and declining an invite - within the Flock app. Who doesn’t like super-fast meetings on the go? We all love our clients. But maybe not all the miles we travel to see each one of them. 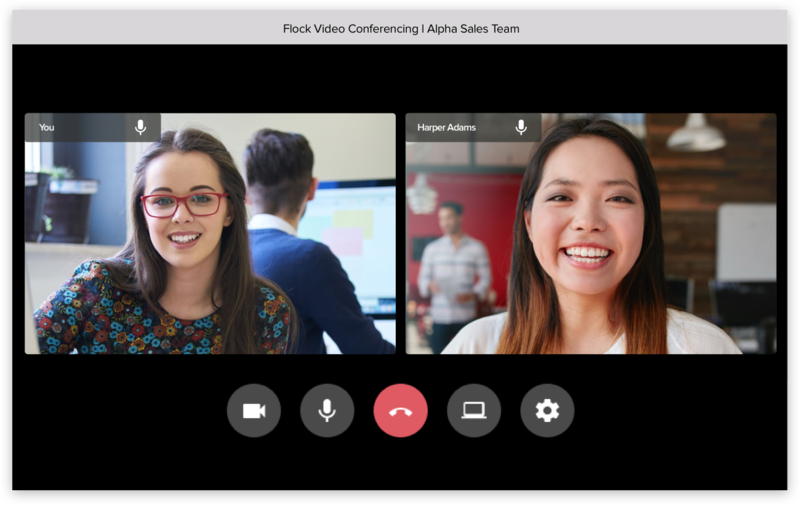 Why not get them on a video call with Flock? All you have to do is add your prospects as guests to your Flock team. You can also share price lists, brochures, and product images with them instantly via the messenger. Oh, and Flock’s video conferencing works just as well for internal team catch-ups. 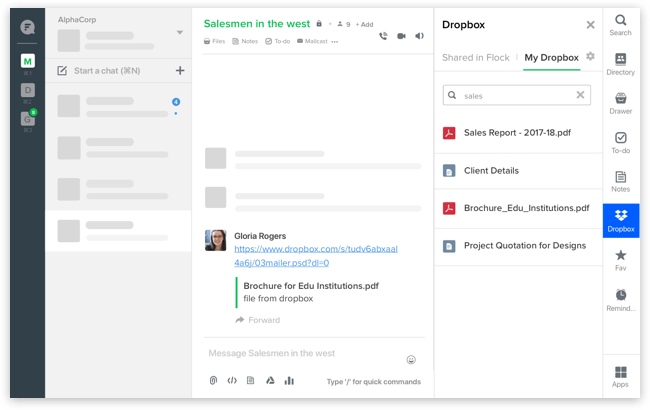 Internal or external — Flock makes online collaboration easy. We’ve all got a little bit of Sherlock in us. And when you’re pursuing someone to buy your product, you better know everything about them. 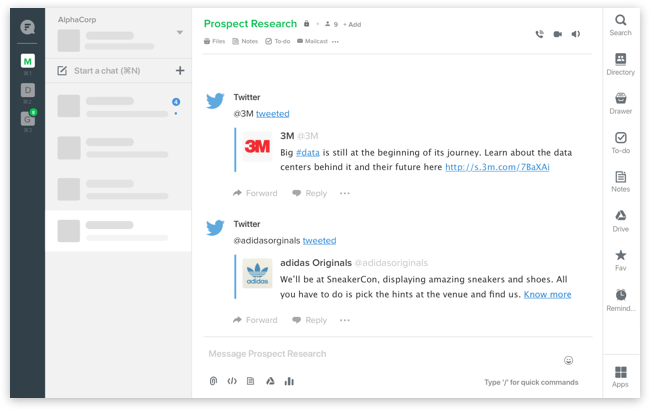 Instead of taking out time to stalk your prospects on social media, use our Twitter integration to monitor the Twitter handles you want to follow and you’ll be notified every time they tweet. With the Facebook Pages integration, you can also see what people are saying about you, get notified when someone sends you a message, @mentions you or likes your posts on Facebook — all within Flock. Think your work is done once you’ve sealed the deal? You know that clients, if and when they face any problem, will call the sales reps they’ve been in touch with. And then they’ll be asked to go back and forth with the sales and customer service teams to look for answers. 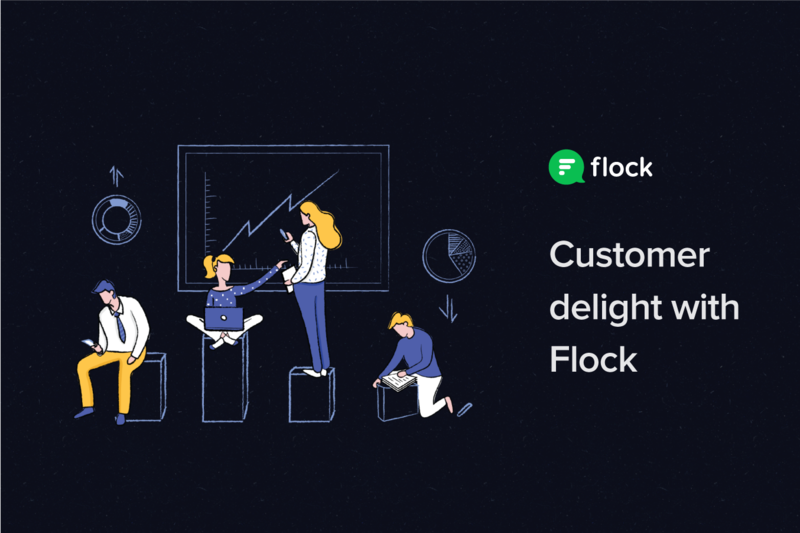 With Flock, you can simply create a customer service channel, post your questions, and get the answers quickly. Even better, your CS representatives can directly reach out to clients and work on solving their issues. If these aren’t enough reasons to bring your sales team on Flock, you’ll just have to get used to sending many more “Hope to hear from you soon” emails! Hope to see you on Flock soon!